Late night binge eating is now considered an eating disorder by conventional medicine. 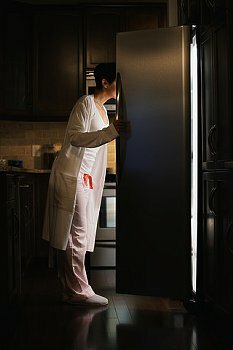 If you think you’re a binge eater, here’s some advice from the New York Times about late night eating and weight gain. ABC News reports about the reasons you binge eat, and how to stop. Eating first meal several hours after awakening. If you’re diet consists of mostly processed foods, and sugars, you’re not getting optimum nutrition. Clean up your diet, by consuming whole foods. Cut down or eliminate sweets, and sweetened food. By the way, almost all food is made with added sweeteners, even vegetarian food. Read labels and find out what’s added to your food. When you consume processed foods your body craves nurishment. You’re going to eat more to satisfy cravings. Instead fill up on whole food, such as brown rice, breads and pasta made from whole grains, not white flour. Salt can also create food cravings – so cut down. Frozen food is overcooked. Skip it and eat fresh veggies instead. Posted on February 7, 2013, in Food, Overweight and Obesity and tagged ABC News, Binge eating disorder, New York Times, Overeating, processed food. Bookmark the permalink. Leave a comment.